Where do I begin with George Stephanopoulos? While he isn’t exactly a great journalist, he is a fine newsreader, who can dance and giggle just as well as any morning show host. I actually sort of like his presence on Good Morning America because it makes it seem that they take news more seriously than they really do. But today’s revelations bring up so many questions. Is it that he “forgot” that he gave $50,000 – oh no $75,000 – to the Clinton Foundation? Is it the fact that he is a former White House operative who covers presidential politics? Is it the fact that he lets himself be embarrassed to the point of sullying his credibility every morning on GMA? No, for today let’s focus on one thing: his non-apology. Dear George is only the latest example of a public figure who gets caught with his or her hand in the cookie jar in some way and then dramatically sets up an apology – that really only partially take accountability. 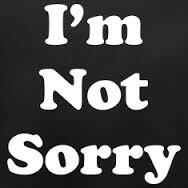 Every apology today is paired with a “but” and in my opinion that makes it a non-apology. There’s always a but – an excuse for bad behavior – which you can bet comes with every public apology by a celebrity, athlete or “journalist.” NBC’s Brian Williams? Rolling Stone’s Sabrina Erdely? And now Stephanopoulos. All delivered either no apology or a non-apology. Ok then George. Because the money you forgot about went to great causes that we all support, it’s all right and all is forgiven. Or at least that is what he would want us to come away thinking. Nevermind that you chose your former employer’s foundation – instead of the hundreds of other ways to help those same causes. And you didn’t even remember that you gave that money – so have you done the follow up to ensure that your money did indeed go specifically to those causes? I doubt it. .
You screwed up on a number of different levels George but the biggest sin in my eyes is that you couldn’t just straight up explain and apologize, that you had to couch it in the excuse for your bad behavior. How about this? How about public figures stop exhibiting bad behavior for which they have to apologize? When you are dealing with the news media, there is no room for “spin” in my world. The first rule of media relations is to tell the truth. Period. The second rule is to be prepared. The third is to never say anything out loud that you don’t want to see in print because backtracking on a misstatement (note I didn’t say a misquote) is tougher than sucking it up and doing the right thing in the first place. Mayor Stephanie Rawlings-Blake is a walking advertisement for those of us who do spokesperson training on what not to do. I suspect her fateful week in April 2015 will make it into many PR 101 courses on college campuses this fall. How did she fail? Let me count the ways – or at least cover four biggies. At the very top of the hit list is her “space to destroy” quote. I’m guessing this was not a well thought-out moment in the Mayor’s life. I sincerely hope that she didn’t run that past any advisors who agreed it was the right thing to say. But as bad as saying it was, defending it was even worse. Calling out the news media for mischaracterizing her quote was baffling. Just roll back the cameras and see what you said, which was “We also gave those who wished to destroy, space to do that as well.” Again, don’t say something that you don’t want to read in print. Use of the word “thug” to describe rioters. She wasn’t the only one to use this term. Even President Obama used this term. But as soon as she came under fire from a Baltimore city councilman, the Mayor backed off her words with a tweet that read, “I wanted to clarify my comments on “thugs.” When you speak out of frustration and anger, one can say things in a way that you don’t mean.” Backtracking like this makes her look weak and that she is more worried about political correctness than being tough on people destroying her city. Press conference pushing match – I read and then saw video of a Fox News reporter being shoved by police and even Al Sharpton when he tried to ask the Mayor questions at a press conference. Now, I’m not exactly a huge fan of the narrative that Fox brings to this (and many) stories but did the Mayor and her staff not realize that any public appearance was going to elicit reporters who may not be friendly to the event that she is attending, asking tough questions. The pushing match was ugly to watch when the reporter was pretty much behaving himself, just trying to ask questions. Unfortunately, the administration of this truly great American city showed it really wasn’t prepared tactically, but it may have even been less ready from a communications standpoint. When Ray Lewis is a voice of reason in your city, that becomes clear. Mayor, please get yourself some good crisis communications training if it’s not already too late for your administration to save face.